Welcome to Part Two of my jaunt to a very cloudy and murky Ipswich today. if you missed part one, which is possible as it was only posted an hour or so ago then click here and catch up before reading this one. 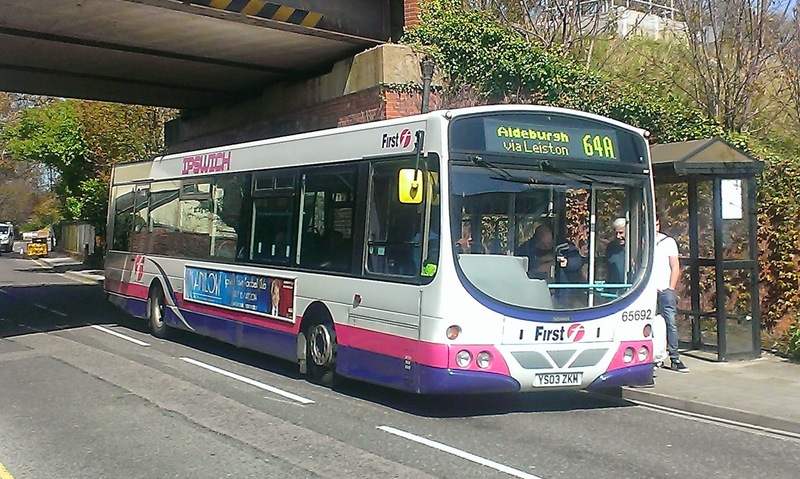 The latest vehicle to return from Rotherham is ex First Essex Volvo B7rle 66986. She will soon be joined by her sister 66985, but for today I was just happy to get a decent pic, with one of Ipswich's finest behind the wheel who made sure I had the shot. This is the first self taken pic to appear on any blog, which is always down to luck and not judgement as I can't just jump on a bus, or in a car and get down there whenever I want. Earlier I had been round the depot and finally got a decent shot of E200 44516. Here she is before the new vinyls had been applied (see Part One). Leaving First now and I was lucky enough to see three vehicles not normally seen in the County Town of Suffolk. Well to be fair the first one has been seen a bit but it sounded good! It looks like those God awful Plaxton Plastic Plasma Primo things or whatever they are called that Simmonds have normally on the 113/114 might be reaching the end of the line as there were two different vehicles on the route today. The first was an AD E200 with what I can only describe as appallingly hard looking seats. However even an E200 mini is better than a Plasmo washing machine! The second rogue vehicle on the route was much more unexpected, however. I have never ridden the route, mainly due to the aforementioned washing machines, but had I had time I would have sunk into the sumptuous seats of Van Hool Volvo B10M coach that appeared today. I'm told some of the roads are pretty tight so it must have been fun getting a coach round there. 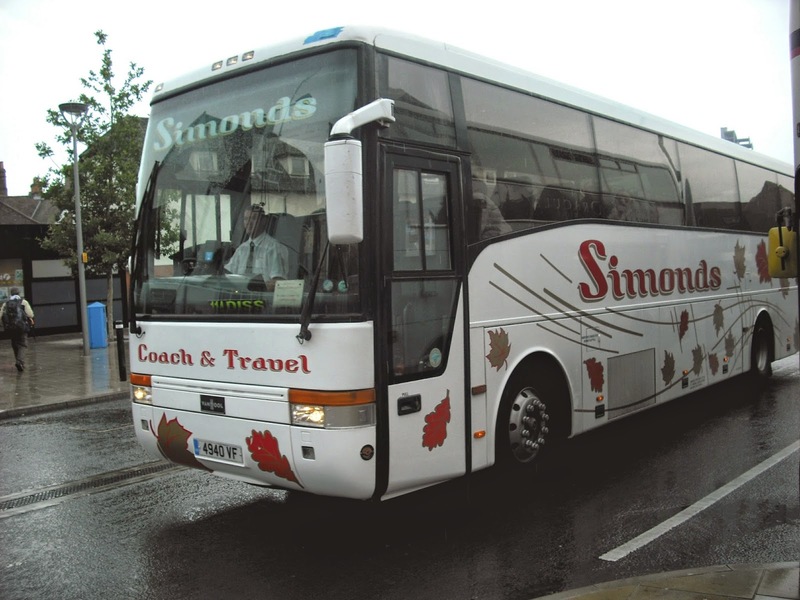 There was a tiny destination board which had mostly slipped below windscreen level, but I imagine the passengers know a Simmonds vehicle by now when they see one. As if that wasn't a rare enough sighting what came in 20 mins later topped it all. I have been admiring the vehicles Beestons have on the 91 between Ipswich and Sudbury for roughly 7 years now but today was the first time I had seen a single decker on the route. I am grateful to Dave from Beestons for supplying the info about this vehicle. X568 YUG is a Volvo B10B formally of Keighley & District in Yorkshire, and is covering on the 91's while the Scania Omnidekka's undergo seat trim refurbishment. 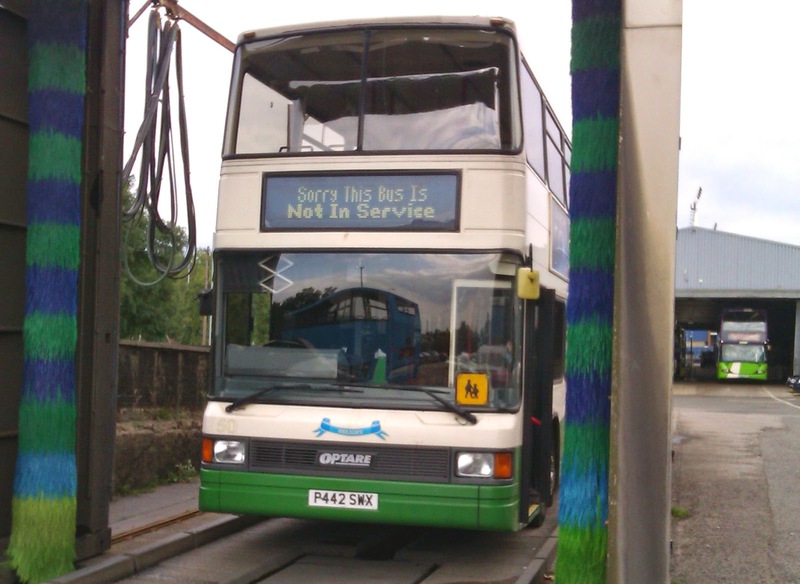 During halfterm this vehicle is undergoing a DDA interior upgrade including seats and floor. I can't wait to see the result of that. Arriving at Beestons this week are ex Transdev Scania Omnidekkas YN54 OAG/H which will still be Transdev red and dual door for now. Dave has promised me an update on the bendibuses soon. To finish the report of today I caught 66957 back to Woodbridge and then a not so luxurious ride on Scania 65579 back to Wickham Market and my Suffolk Links minibus home. My thanks to all managers, staff and drivers for making today worthy of two posts, which I wasn't expecting when I left home this morning. A bumper double post today on all things Ipswich, with apologies to Ipswich Buses fans as they seem to have missed out on this one. My day started in Saxmundham waiting for my usual bus into Ipswich, which in the past hasn't been known for getting the top quality vehicles. However, today was to prove the exception as B7tl 32488 turned up, and it seems I have to thank the good little girls and boys of Kesgrave High School for overcrowding a singke decker which means I may get a decker on that run a bit more often. Now those of you with 24 hour memories will recall that 32488 was the vehicle involved in a close encounter with a building last week in Ipswich. Well as you can see she is alive and well and every time I get on one of this batch of B7's I remind myself they are only one year younger than the heaps of Presidents at Yarmouth and Norwich. Such a contrast. My mission today was to get pics of the latest arrivals from Rotherham and I wasn't disappointed as pretty soon 66957, fresh from wowing the crowds at Showbus came in on the Stowmarket run. Luckily for me she changed routes later and I caught her to Woodbridge, and she still smells of new leather! Soon after the latest decker to return from Rotherham, 32486 rolled in on the 66. I thought I'd compare the before and after, as I think this vehicle provides the most vivid contrast. I then went round the depot to see what was going on, and it was a hive of activity. I got my usual cheery and friendly welcome which was a real morale boost and centre stage was E200 44516, which was a result as I still hadn't got a decent pic of her. I was advised to come back later as she was going to be the first to have "Free WiFi" vinyls applied, so go back a couple of hours later I did and here you are - the first pics of the new vinyls. I can now give a full update on the comings and goings at Ipswich. Currently away at Rotherham for refurb are Volvo B7tl's 32492/3, and Volvo B7rle's 66985 and 69010/422/5. Depending what comes back tomorrow another decker or P&R B7rle will go up there this week. There is no news on transfers, so no idea when 69006 will arrive, and at the moment 69431-3 are still at Ipswich, indeed 69433 is parked around the back looking rather sorry for herself. I will update as and when I hear anything I get clearance to publish. As usual my thanks to Barry and the boys at Ipswich for making me feel so welcome. OK that will do for Part One - coming up in Part Two first pics of 66986, and a couple of very rare workings. It has not been a good week for this blogger. First of all I missed out on getting to walk around the nation's biggest coach park last week due to my lift to Ipswich letting me down, only to find out today that the company based at the bottom of my garden took a vehicle, passed me while I was waiting for my lift not to turn up, and even waved without either of us knowing where the other was going. I will book early for next year. Secondly there has been some ill feeling going on between certain bloggers. I was accused of putting up false information last week, which turned out to be correct information, and it all got rather personal, especially on Twitter. Now we all make mistakes, no one's perfect, especially me but we need to remember we are all in the same hobby, and it IS a hobby as no one as yet is a professional. The constant jibes and competitiveness is starting to get to me a bit, and that is why there have been few posts this week. It certainly wasn't what I expected when I started this. Anyway let's get on with the news as no one came here to hear me moan! In Ipswich the second P&R B7rle to go up to Rotherham was 69422, returning this week was B7tl 32486 I assume looking slightly less tatty than when she left. No pics yet but I'm in Ipswich tomorrow so hopefully will get one then, Scania 65630 finally left for Essex where I assume she was greeted with the appropriate enthusiasm! On Thursday the inevitible finally happened and a bus hit the building on the junction of Northgate St and Great Coleman St due to a badly parked van, The vehicle involved was 32488, thankfully no one was hurt and 32488 has not yet been repainted, and initial reports suggested repairs would take months. They appear to have been a little pesimistic as apparently it was no more than a couple of broken windows and 32488 is already back out in service. The pic below is taken from the Ipswich Star, whose full report, including a video can be seen here. 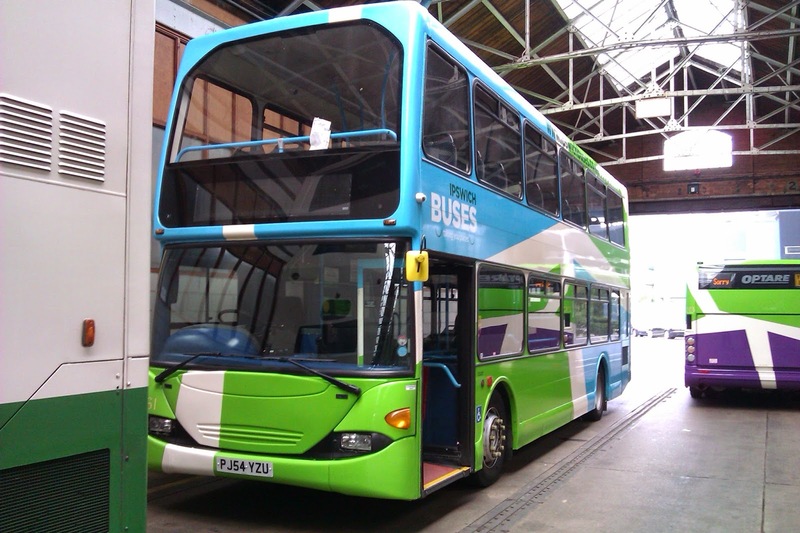 There has been much talk about the new livery for the Norwich Network, where buses will have their fronts painted according to the routes they work. Except that's not quite it. 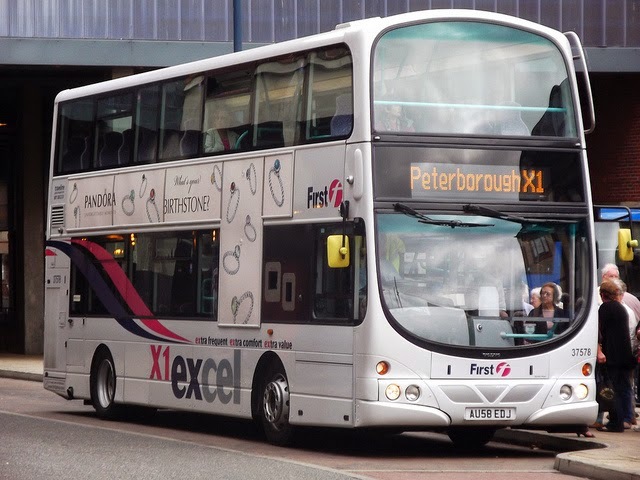 It has transpired that the new Streetlites will be devoid of any branding whatsoever, so they can work other routes on Sundays, as will many other members of the Norwich fleet. Doesn't that defeat the objective of branding? 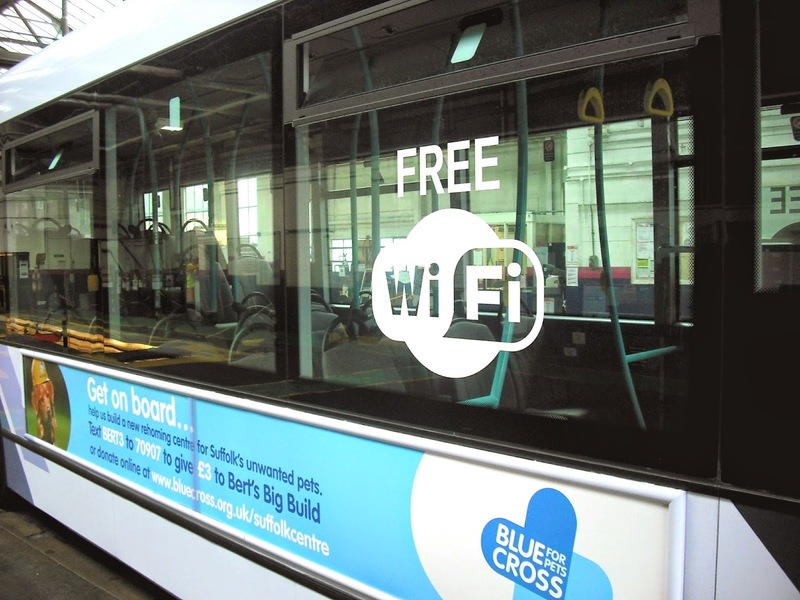 Branding is to make a bus on a particular route easily identifiable for those too lazy to read a destination screen. If you don't know if the bus is going to be branded or not you have to rely on the destination screen anyway and just makes everything look a little half hearted. Anyway since it seems Norwich won't get to see any purple fronted Streetlites here's one that has appeared at First Potteries, as published on Twitter this week. I'm undecided if Norwich should be grateful or not. As reported last week the two Presidents from Yarmouth, 32201/2 were transferred to Norwich and quickly saw service. I happened to be in Helllesdon on Thursday and got a pic of 32202 working a service 28 (I think) into Norwich. Finally as far as First is concerned I have noticed several X2 journeys operated by extremely full little Darts this week, and many 99 journeys operated by virtually empty double decker Geminis this week. My mind is trying to correlate the two but is failing miserably. Official explanation anyone? An eventful week at the Beccles yard this week, most of which my lawyers have advised me not to publish. So the only piece of news I have which I can tell you is apparently withdrawn Trident 715 was seen over the pits looking like it was being prepared to re-enter service. That is only an unofficial report so don't shoot me if it's wrong, but Anglian are short of vehicles so it would make sense. I have also heard one of the Omnilinks which recently had a new engine promptly blew the new one up too so that could be a long term casualty. I'll try and find out which one! Add 50p booking fee and I got the lot for £17.50. I think that's one of the STEVE awards well and truly sewn up!!! Cannot wait to sample one of the magnificent Sleeper Coaches. I have an eye check up in West Sussex on Tuesday so check in throughout week for reports and pics from far and wide! Over the last 2 or 3 weeks I've been on some pretty busy buses. 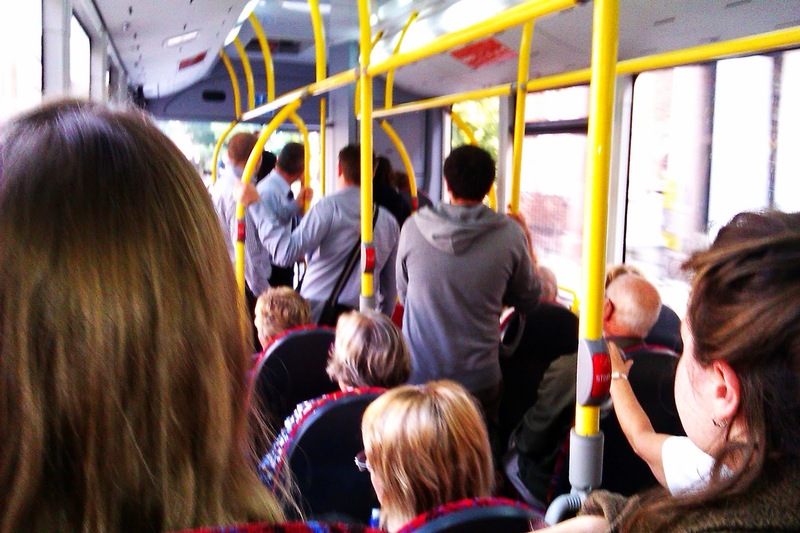 There has been overcrowding on the 88 between Halesworth and Norwich, the 64 between Saxmundham and Ipswich, the 118/9 between Framlingham and Ipswich, and I have noticed other routes with more passengers on them than usual. It seems it is not my imagination as today's Ipswich Star reports a 4% increase in bus travel in the year 2013-14, and I don't think all of them were mine! 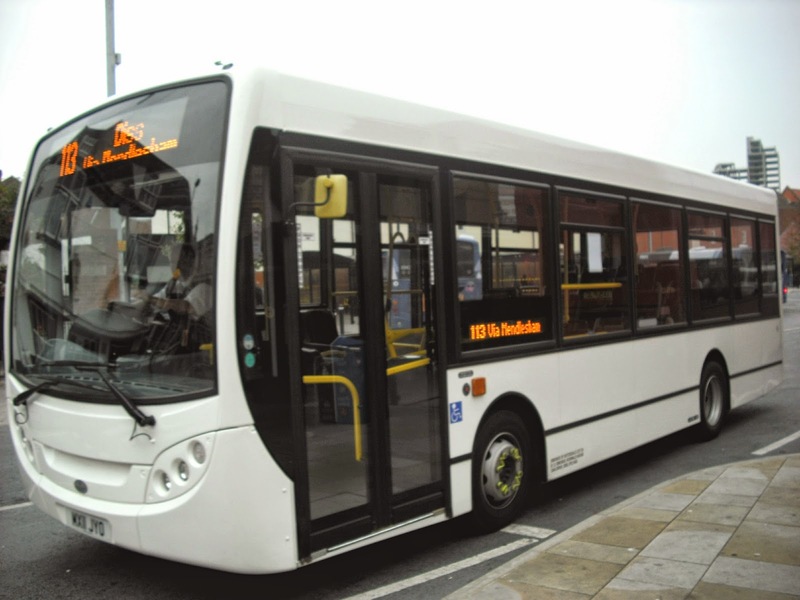 This is good news and could be a stepping stone to increased and better services - for example I have heard reports that Anglian are considering running later services again on some of its routes. This is a sensible idea, as after 4ish buses running into town are virtually empty because people just can't get home again. Just remember that it is pointless running evening services if they don't run late enough for people to get home from an evening at the cinema/theatre etc. Co-ordinating with trains would also be advantageous. I would also suggest operating companies take steps to accommodate the increase in passengers by providing the appropriate seating capacity on the routes where overcrowding is an issue, or those passengers will very quickly go again. However, the article warns that rural areas aren't so lucky, and to be honest the comment from SCC is laughable. I see an opportunity to rebuild the bus network, incorporating less populated areas with more profitable routes but that will need enterprise from the operating companies, and support from local authorities. It can work if people want it to work, but is there the desire to make it work around here, or will the cash cows be milked to exhaustion. We shall see. Anyway you can view the full report in the Ipswich Star by clicking here. Our passenger numbers are up on last year, although as I stated I feel that most of this is coming from growth in customers traveling to out of town stores such as John Lewis at Home and Waitrose at Futura Park in S E Ipswich and our new service 4 to M & S Food and Next at Martlesham. In the last three weeks our passenger numbers are up on the corresponding week last year by 5.8%, 6.3% and 5.2% respectively, so we are seeing an upturn which is good after a few years of recessionary decline. Many thanks for the email, Malcolm, and for permission to reproduce it on here. I was in Norwich today hoping to get a few decent pics - for example I saw an ex Anglian Versa on the X6, but unfortunately most of the time I had there was taken up waiting for the East of England Ambulace service to attend to a girl with acute abdominal pains who I called an ambulance for - 56 mins and they confirmed it was treated as an emergency call. Dear God that's awful - not as though Norwich bus Station is in the middle of nowhere! So no pics tonight, but on the way to Norwich, a driver I know reminded me of a topic we have spoken of before, and I know full well there will be an even split of oooooh good idea and snorts of derision! When I was a driver, and indeed Conductor I had several incidents and sightings that relate to ghosts and the unexplained. Now I know that Yarmouth depot is meant to be haunted by old tram fitters making metallic banging noises at night for example, so I would like as many of you as possible to send in your transport related ghost and supernatural stories for a special around Halloween,. How many parts it turns into depends on the number of stories I receive, Stories to the usual email address please. 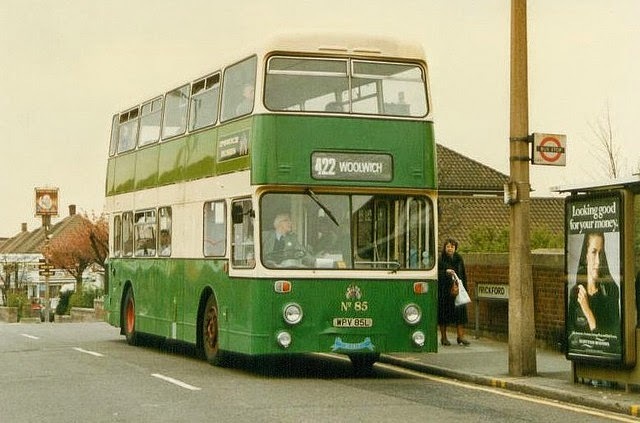 To give you a flavour of what I'm after: when I was working for Boro'line in the very lste 80's I was driving a bog standard Optare bodied Leyland Olympian on a very quiet circular route from Eltham via Chislehurst and Sidcup (the 328 for those who need to know). I was driving up a street in Chislehurst when I heard footsteps upstairs. Assuming someone wanted to get off I pulled up at the next stop only to realise I had an empty bus. I put it down to lack of concentration and carried on. An hour later, on my next trip I got to the same place and heard footsteps upstairs, and the sound of someone coming downstairs then losing their footing and clatterting down the stairs. Now anyone knows there is no sound like that so I didn't even bother lookng in the mirror - I just pulled over, opened the doors, and yet again discovered I had an empty bus. When I got back to the depot I asked to see the vehicle records to see if anyone had ever died on the bus etc but rather annoyingly nothing of note was there. So why I heard all that on that particular night I have no idea. Anyway that's the sort of thing I'm after, so now it's down to you my friends - there's an Anglian driver who loves these kind of things relying on it! An extra post today to deal with a few issues that have cropped up since yesterday, and to put in things I forgot yesterday - it's my age! Since I wasn't wandering round a giant coach park yesterday I was doing a bit of surfing looking at some blogs from other areas, and I'm pleased to say I discovered a couple of belters. 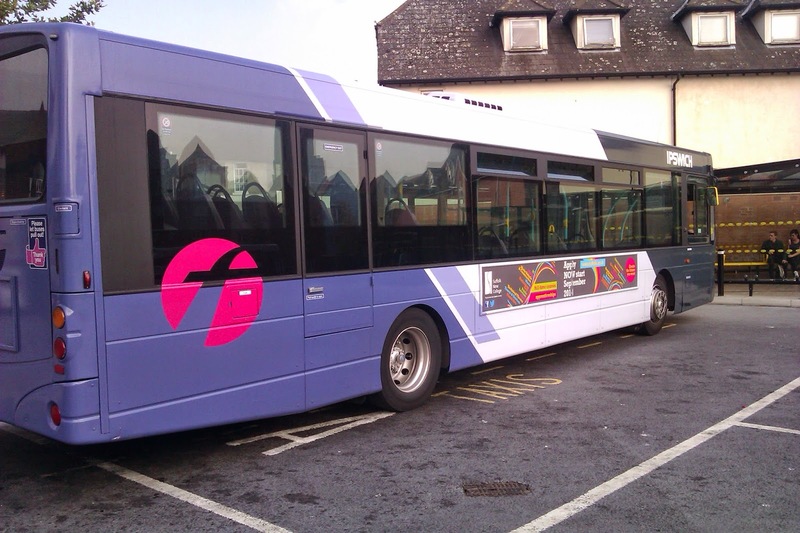 First up we have Plymothian Transit, which you will guess from its name concentrates on the Plymouth area. However, it has the biggest and most well laid out reference section to blogs around the country I have seen on any blog, and Graham is obviously a man of very good taste, as yesterday this blog was on top of the pile! I would urge you to take a look at that excellent blog by clicking here. It was through Plymothian Transit that I found my second gem - Public Transport Experience - which is run by the twin that was clearly separated from me at birth. Calling himself Fat Bus Bloke (see what I mean) the blog is a fascinating look at transport around the country, told in a highly entertaining and somewhat cynical (see why I like it) manner. There is a daily post of amazing variation and detail, and this could become part of my daily routine. Make sure you have time to spare and then click here for a really good and informative read. There is also a third new link, which is a bit different. Regular contributor and downright nomadic driver Rob Collins has started a new blog. I'm sure many of us have been on a bus going down South Town Rd in Yarmouth and looked at the ships in the docks and wondered who they are and what they do. Well Rob, as it turns out, is a bit of a ship nut and has launched his own blog called Great Yarmouth Shipping photos. I'm happy to include this interesting blog in my links section and may God Bless the blog and all who sail I mean read it! You can take a look by clicking here. 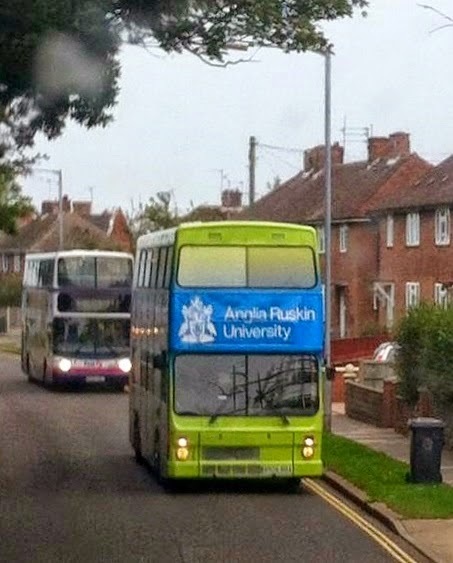 Jamie Skinner kindly sent myself and Roy from East Norfolk bus Blog a pic this morning of Anglia Ruskin University tour bus in Gorleston this morning. I am going to shamelessly use the info Roy put on his blog and tell you that it is an ex National Express West Midlands MCW Metrobus, fleet number 2926, and is doing a tour of schools and colleges in the East of England promoting the university. One can only hope the easily confused people of Gorleston didn't think it was yet another different liveried bus for the X1. My thanks to Jamie for the pic and Roy's full report can be found by clicking here. 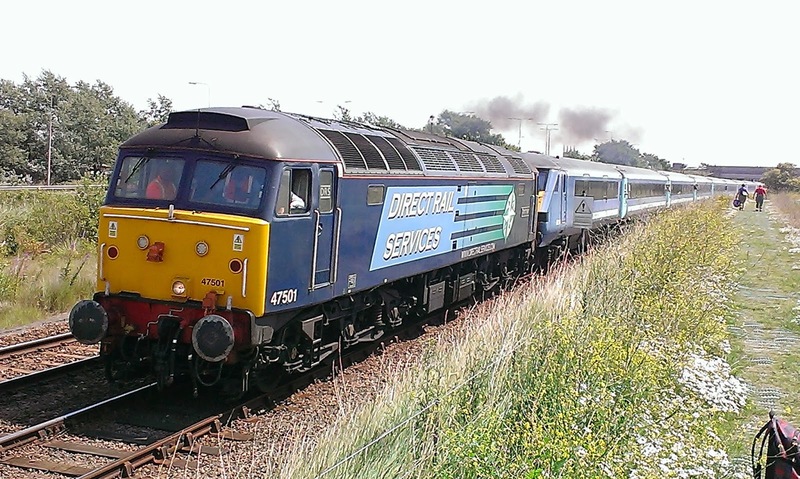 Yesterday Roy's blog also confirmed the departure from Yarmouth of Presidents 32201/2 to Norwich. Such was the case yesterday in my Weekly News Round Up. I stated that Geminis 37578/9 as part of the repainting into X1 colours would get leather seat covering but not air chill, as the E400's do. I took that info from a tweet I remembered seeing from the Eastern Counties Business Manager in response to a query from another blogger. It is possible my memory may have played tricks on me but it was published in good faith. However, the following comment was made, under the name "anonymous", stating that I was mistaken and in fact it was only being painted. I immediately removed the sentence about the leather seating until I got official clarification, which I am still waiting for. I also stated that the first P&R B7rle to go for refurbishment was 69428, which was the number I remember being told, but that was also wrong and as soon as I was told it was 69425 I corrected it. I'm only human, I cover more areas than any other blog in this region, and as such mistakes will creep in occasionally. That is why I welcome comments helping me out. What I do not welcome, though, are comments making snide remarks from the cloak of anonymity. I reserve the right to remove them, and I will continue to do so. However, it would appear that the removal of the comment yesterday has generated more bitchiness than you'll find at a convention of trainee beauticians. So as I recieve emails with copies of every comment published I will reproduce it below, then everyone will be able to see why it was removed. I am once again resisting the temptaion to ban comments under the name "anonymous" as I appreciate some people have to remain anonymous for professional reasons and I respect that. Luckily I know exactly who this Anonymous is, and the fact that despite him knowing that he is at it again speaks volumes. Had I been able to edit the last sentence out I would have done, but having an open comment policy that faciilty is not available, so I decided to remove the comment while taking the info on board. Incidentally I have also heard from someone else that the two Geminis are getting air chill so I'll just wait for official clarification. If I don't get it you'll hear nothing more about those vehicles until the first one returns solving the mystery once and for all. I have just had clarification from the Business Manager Eastern Counties and guess what - 37578/9 ARE to get leather seating. It won't be done at the same time as the painting as the painting is being done "out of house" but they WILL be done. I'll just sit back and wait for all the apologies to flood in. Yes I have the tube of Anusol standing by as I know it will be a long wait!! Manor Park Station Friday afternoon with a class 315 going "ooh, ooh that's cold"!! 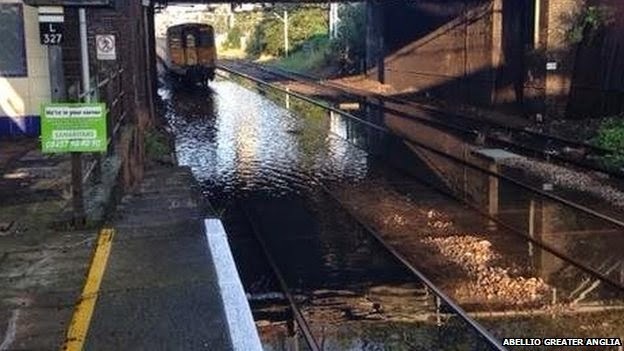 Now you would have thought completely buggering up the afternoon peak on a Friday would have been enough divine retribution but no, Saturday morning saw a repeat performance, this time at Witham. 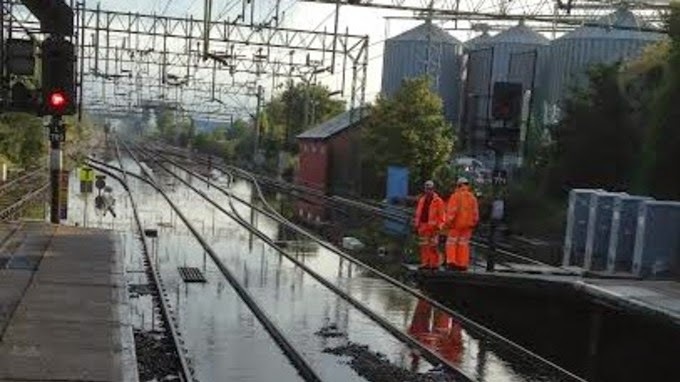 Although it didn't have quite the same magnitude as the Manor Park flood it was still impressive enough to cause considerable inconvenience to those travelling Saturday morning. I defy anyone to blame GA for these incidents. Not even Notwork Rail can be held responsible for the weather - except how the network copes with light snow obviously, so for the sake of rail passengers PLEASE turn those little red lights off at night!! Welcome to the Autumn Equinox Round Up. I hope those of you who went to ShowBus had a great time. Due to being let down by a so called friend I never even got out of the village to get to Ipswich to join VA479 for the trip. Oh well. Anyway this is what has been happening. In Ipswich the final E200 to go through the refurbishment process, 44516 returned on Tuesday and was out in service by Wednesday afternoon. That means that service 53 should be entirely E200 operated now. Thursday saw the return of ex Norwich B7rle 66957. This vehicle is booked to go to ShowBus and therefore won't see normal service until Monday morning. Due to a shortage of leather in Rotherham the return of B7tl's 32486 and 32492 (I think) have been delayed. On Thursday the first of the ex P&R B7rle's, 69425 was taken to Rotherham only a year or so after being painted out of P&R colours. Thanks to my contact for clarification! Elsewhere it has been decided that the two Gemini's to be painted into X1 livery will be 37578 and 37579. One of them has already gone for conversion. It's been a pretty quiet week for other news, so a recap on things you may have missed. A new company has been announced for Kings Lynn. Coastal Red has been given a licence for initially 6 vehicles, and is being run by Stephen Challis, who together with Julian Paterson set up Konectbus. it is highly expected that Mr Paterson will join Coastal Red once he has left Konectbus, as announced last week. It has also been confirmed that Borderbus are going to amend the timetable to their 146 Southwold - Norwich service from 3rd November. Expect to see extra PM services. Borderbus BB62 BUS on a 146 "short" to Worlingham on Monday. Will this journey be extended in the new timetable? I was going to save this for a separate post but as it's a quiet week it seems a good opportunity to post it now so here is a special announcement. I have been considering this idea for some time now, and have decided to run with it. The film industry have the Oscars, the music industry the Grammys, so therefore at the end of the year I'll be announcing the first recipients of the STEVE awards for services to public transport. Now as you'd expect they will not be for the usual things, so these are the catorgories I have decided on. Winners will receive a framed certificate and where winners are employees I'm hoping to get the awards presented by their managers and obviously take pics to be published over Christmas. If anyone has an idea for an additional category let me know - NO there will NOT be a Most Grumpy Blogger OTY!!! I'm afraid this is not an open vote and I'll be deciding the winners, but I hope that on the whole the decisions will be well received. Academy Awards? Academy who? 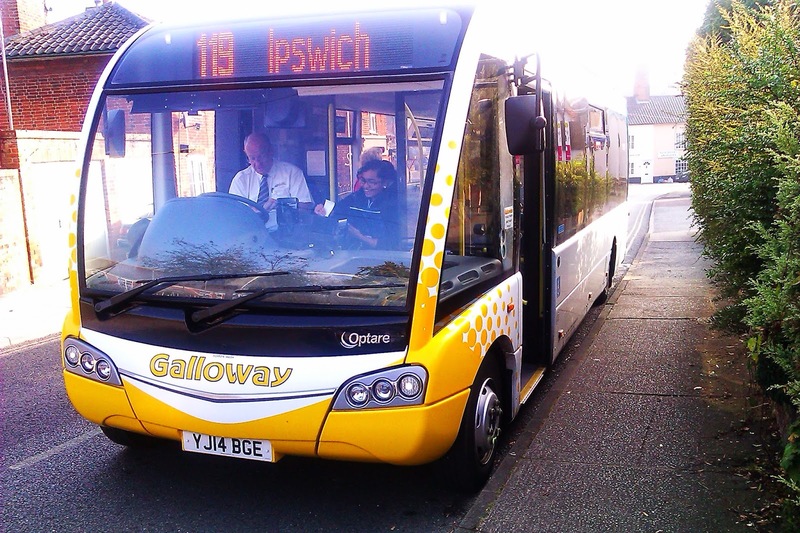 On Thursday I decided to go the quick way into Ipswich which means booking a minibus to take me into Framlingham, then catching either the 118 or 119 into Ipswich, operated by Galloways. This used to be operated by Solos or Beavers, but due to passenger increase an MCV Evolution has had to be brought in, of which more in a bit. A few weeks ago I posted on Galloway's new Optare Solo, and was a bit critical of it - hard seats, bad reflection from the destination screen and uncomfortable driver's seat. Well I have actually ridden on it now and so here is my ride report - a feature seemingly unique to this blog. First of all yes the seats are hard, and I'm not sure anything more than the 45 mins I spent on them would have been very welcome but I wasn't suffering too badly by time we got to Ipswich. That, however is the only negative point I can find about this new Solo. It is noticeably quieter than older models, smooth and everything about it feels solid. And best of all not a single rattle. Not one. Which proves that is IS possible to build a new bus in 2014 that doesn't rattle, which justifies every single gripe I've had about new buses rattling since this blog started. The roads on that route aren't exactly brilliant either. I'm not a fan of little buses - never have been as I like going on the top deck and getting decent views, and minibuses did rather spell the end for buses as I grew up with them. But you will hear no complaints from me if I have to get on this Solo again - just wish there was that bit more padding on the seats. I was lucky enough to have a coffee with one of this blog's biggest supporters. It's quite pleasing to know that part of someone's daily routine is to make themselves comfortable and spend time reading what I am posting. My ego was well and truly massaged so thank you, Paulo, and best of luck with the course you are taking. 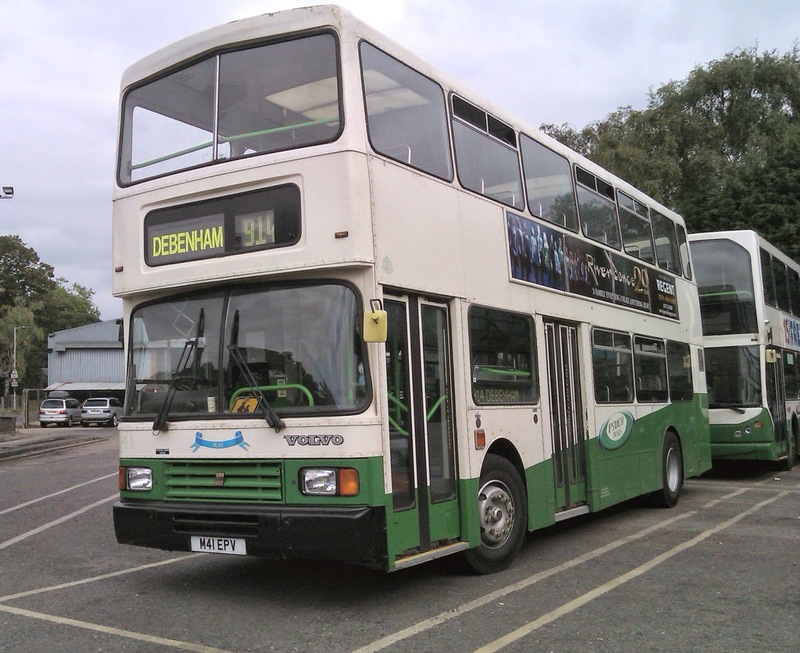 I had a couple of hours to kill before my bus back to Framlingham, and was just wondering what to do when I saw an Ipswich Buses Trident pull into old Cattle Market showing 98 Shotley Marina. The 98 is normally Solo operated, occasionally a little Dart, and I've never been on the route, so checking I could get back in time I got on it and sat back, in comparitive luxury as the vehicle was IB14, which has tables, WiFi, and even a radio (not used) as it formally operated the 196 BT contract. The reason this journey is operated by a decker is it serves Holbrook College and picks up a large number of noisy but otherwise well behaved school students. It was after we left the school that the reason the route is normally little bus operated became clear. I have been on some tight routes for big buses before - the 62 between Halesworth and Beccles is tight enough but this route between Holbrook and Harkstead is INSANE!!! I'd think twice about taking a large car down there and there were times the hedgerows were brushing both sides of the bus simultaneously. Vision from the top deck was spectacular but from the driver's seat must have been terrifying. 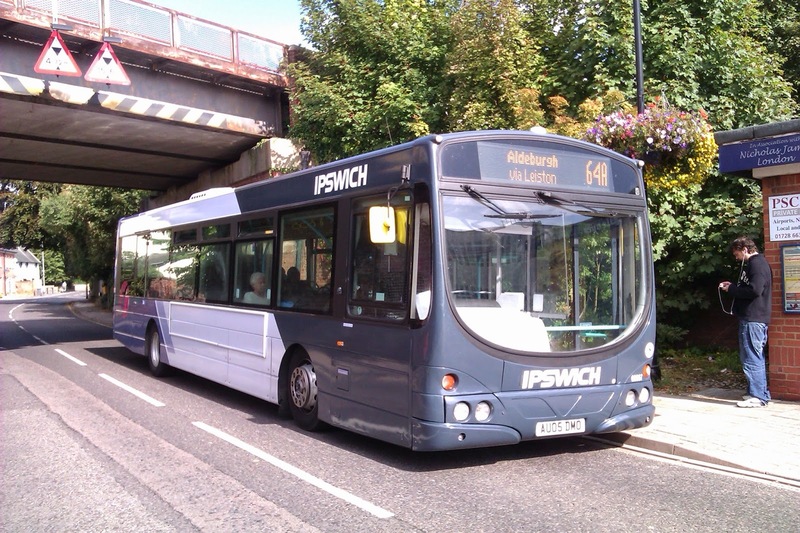 I must mention the driver who was not only an extremely capable driver, but also a really nice young guy who is a regular on this run and a real credit to Ipswich Buses. We got to a very sunny Shotley Marina with just enough time for me to grab a quick pic with Felixstowe Docks in the background,and then glory be go back the same way. I will definitely do that trip again and can't recommend it highly enough. So back to Ipswich and a return to Framlingham on the aforementioned Galloway's MAN MCV Evolution. Again I have no complaints about this bus at all. Being a MAN you know it's going to be quiet, but comfortable seats and a smooth journey made it a perfectly acceptable ride back. All in all a very pleasant day. I was pleasantly surprised to wake up this morning to an email from Malcolm Robson of Ipswich Buses alerting me to yesterday's Notices and Proceedings for the East of England. Two items of interest to our region, most notably being a new company being awarded a licence in Kings Lynn. Coastal Red has been awarded a licence of initially 6 vehicles, but it is the name of Stephen Challis as director that makes the ears prick up. He, together with Julian Paterson formed Konect and don't be surprised to see an additional director announced in the coming weeks. Will be interesting to see what routes they are thinking of doing. Director(s): ANDREW WARNES, STEPHEN CHALLIS. 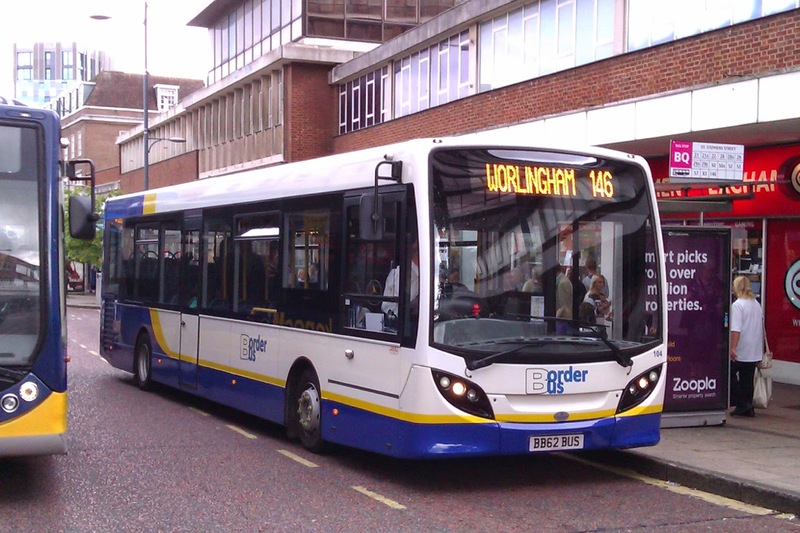 Also in the proceedings was confirmation of Borderbus's changes to the timetable of their service 146 between Southwold and Norwich. I am led to believe that. as expected addition Pm journeys will be added to the schooldays only timetable. You can read all the notices and proceedings by clicking here and my thanks to Malcolm for the heads up. And not a First bus amongst them! I decided to do something a little different today and venture to places hitherto untouched by my presence. 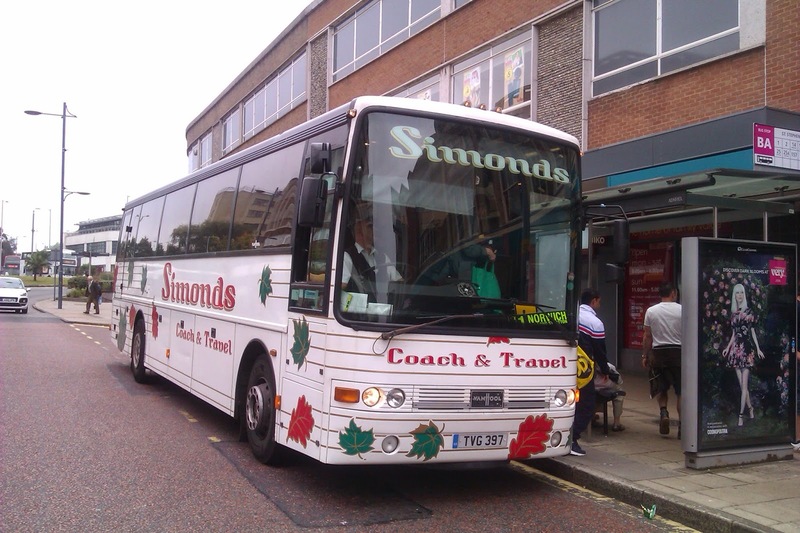 I went straight to Norwich on a packed 88 from Halesworth (more later on that) and decided to see what Simmonds had out on the 1 as I have never been on that route before. 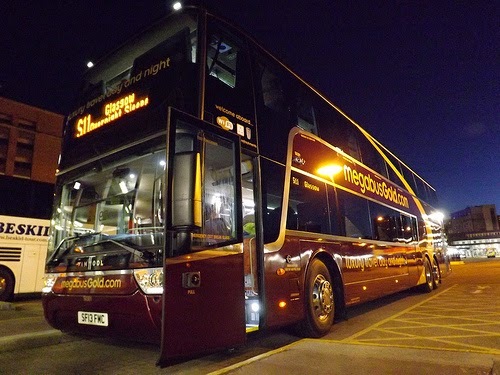 I was rewarded big time when MCV Volvo B7R BU14 EGD rolled up at the stop. Now a few weeks ago I absolutely slated the Volvo 9700 Hybrid that First Essex operate on the 100 Lakeside - Chelmsford route. Hated them. Not this one. Loved it. Quiet, smooth, comfortable. A bit rattly which is always annoying in a new bus but I noticed the roads weren't exactly silky smooth so maybe a little leeway there. Not much mind you as I bet an Olympian wouldn't have rattled/ But anyway why anyone buys an E200 when the B7R is around is anyone's guess. I got off at Long Stratton to catch one back the other way, and instead of another bus got a real surprise when a coach turned up. 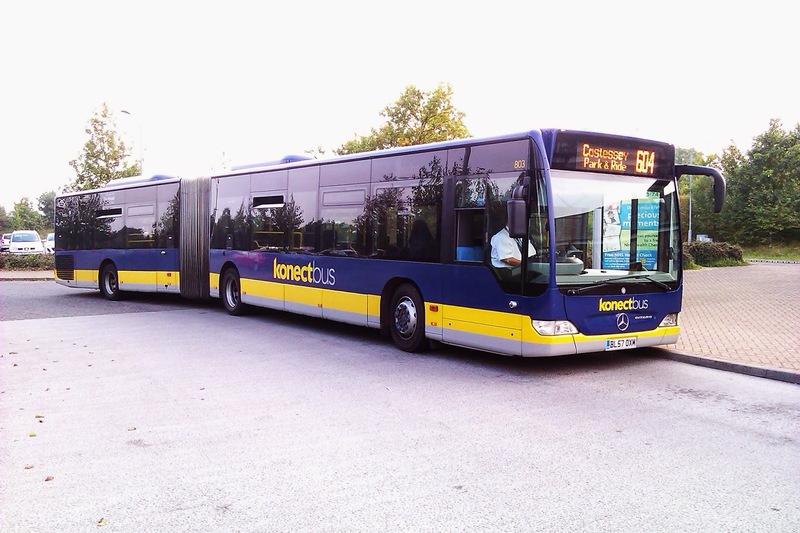 Van Hool bodied Volvo B10M TVG 397 to be precise. A very comfortable ride back to Norwich ensued and I was so happy I had let the soon to be extremely purple Plaxton President on the 36 go! Speaking of coaches I saw something on arrival at Noriwch earlier that had me scrabbling to get off the bus like a dog desperate to be let out for a wee! Megabus had one of their amazing Volvo B11R Plaxton Elite Interdeck coaches on the M37 to Cardiff this morning and I wanted a pic of it before the lights changed. Seeing me sprint is probably quite a sight but I got there in the nick of time. 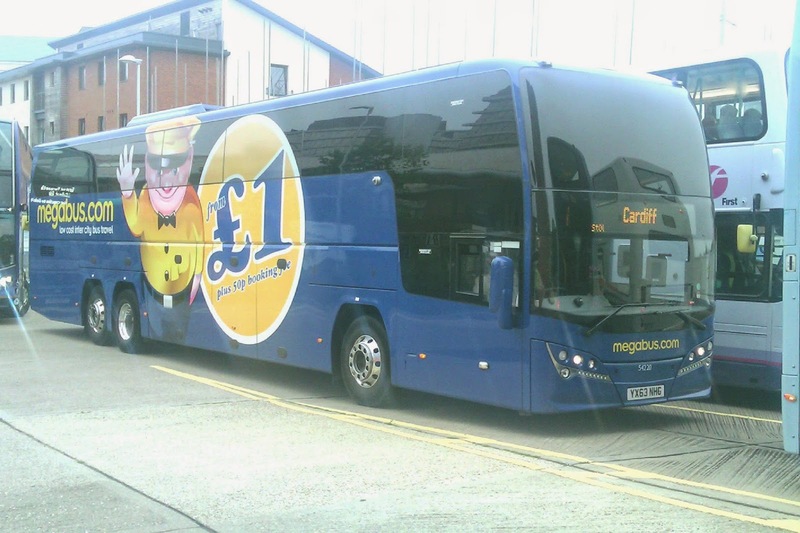 According to Megabus if demand stays high these may become a regular sight. I hope so. So after lunch and another of my now daily arguments with EE on how my phone's camera is going to be repaired I was at a loose end so decided to something I have never done - and that is go on a bendibus that wasn't in an airport! Yes I know but I never went on a London one and don't use P&R! So I forked out £1.70 to go to Costessey and back. I got on expecting to seriously dislike them but the opposite was the case and I'm kicking myself for not getting on one many years ago. It felt really spacious, two buggy areas would make a huge difference and it's a shame there aren't many routes in this region they would easily fit on. So I arrived at Costessey, promptly had a row with the phone camera that IS working, and then found out something. Now I am well aware the competition the next headline has, but this is well up there. Now first of all I should mention that my all time favourite characters are Basil Fawlty, Victor Meldrew, Edmund Blackadder (III and IV) and just a bit of Jim Royle thrown in for good measure. So I like a good moan - what you hadn't noticed? 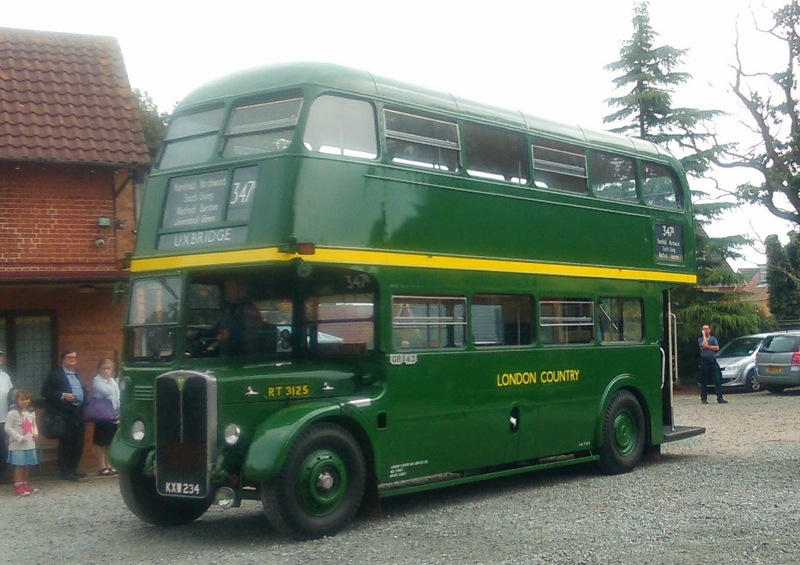 Anyway my intention at Costessey was to stay for a bit and try and get pics of as many of the bendibuses as I could. Fat chance. It seems if you travel between 4 - 6pm on Norwich P&R you have to pay more. If you hold a so called off peak ticket you pay extra to travel at this popular time. Now that is ridiculous in itself, and is hardly going to do anything to encourage people to leave their cars in the middle of nowhere then get on a bus into town. But wait for this - that is regardless of which direction you are travelling in!! So I had to get back on the same bus and go back to town as it was the last off peak bus before I would have had to pay more than the same again. How many do you think were on the bus with me? Go on have a guess!! Really? That many? I had the bus to me, myself and I, and was reliably informed by the driver that I would have had the next 10 to myself too yet Norfolk County Council think you should pay extra to travel on an empty bus. Perhaps that's why it was empty.. As Victor himself would have said - "I don't belieeeeeeeve it"! Now back to what I alluded to earlier over the overcrowding on the 88. It is getting to the point something needs to be done or someone else might do it. Since I have been travelling on the route the first bus from Halesworth after 0930 is full by Bungay. Quite often standing by Poringland and lots standing by time it gets to Norwich. It's a decker in school holidays but not schooldays. I mentioned a few days ago that the 1600 is now packed because the 1555 relief bus on schooldays has been scrapped. Today the 1630 had a standing load when it left Norwich, and when I joined the queue for the 1700 which I thought was going to be the last remaining yellow Trident 712 there were pensioners there who had let the 1630 go as it was too full. There were a lot of people waiting. Now normally I am overjoyed to see a gas bus, but not tonight as this is how it looked when we left Norwich. Where was the Trident? It seems diagrams have been changed and the 1700 is now booked to be a single deck vehicle. This is not good. Now everyone knows that school contracts take precedence over fare paying passengers but why have 711/3/5 been withdrawn in recent months? Why have 3 Konect Tridents gone south last week to Hedingham (I assume as they were spotted heading south on the A12) when buses on a profitable route are getting overcrowded to this extent. Anglian should take note of this and take action. Yes new deckers are due in January, but Go-Ahead needs to find 5 or 6 deckers PDQ or someone is going to notice this constant overcrowding, and step in to mop up the excess and take quite a few with them. It's not rocket science in this ultra competitive market where poaching other companies' passengers seems to be the norm now. You can say you saw it here first. Just quickie as there was no update in my round up on Sunday. More Brle's have had the Ipswich vinyls applied, and some have had some First vinyls applied too. the one to look out for is 66950 which is the first to have the full set, but 69007/9/11 have also got varying degrees of application. I managed to catch 69011 in Old Cattle Market this afternoon and managed to get a broadside shot to demonstrate. As a footnote I would like everyone to join me in giving best wishes to Chris Speed. The poor chap has been unwell recently but I know he is still determined to make it to Showbus. Hope you make it, buddy. 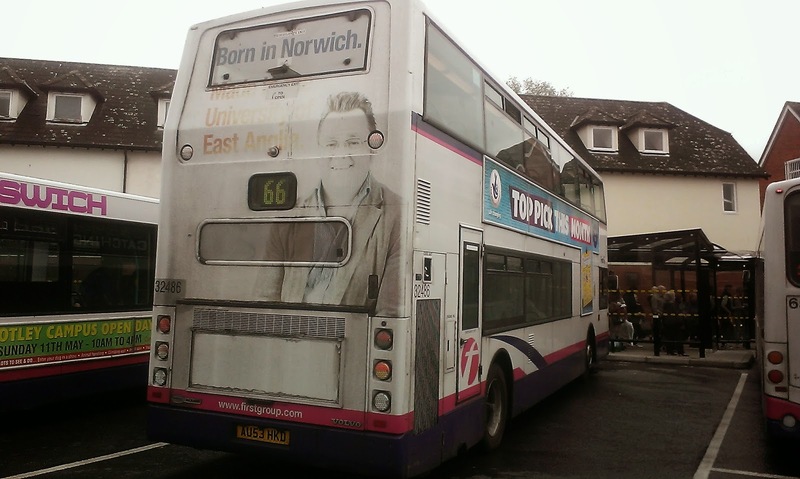 Yesterday I had a major rant about the multicoloured route branding First Norwich are going to be giving their buses. Today whilst walking in Norwich City Centre I witnessed the following conversation between a father and his 8(ish) year old son. I swear this is true and my sides are still hurting from the laughter. Son: We were doing William the Conqueror at school today - do you know how he won? Dad: Did he win in four shots? Therefore I feel I owe the management at First my humble apologies. Not only do some people in Norwich clearly need colour coding on the buses but may I also suggest each route has its own uniquely identifiable tune played through ice cream van style speakers as the bus pulls up to the stop!!! As far as I'm concerned the shorter this post is every Monday the better the past week has been for passengers, and tonight's is pretty short. There have been no major incidents this week. If I reported every single slight delay or minor incident I'd be here all night and you would be bored to death, so I'll just give a quick summary, Overunning engineering works at Bury caused the first couple of trains to be affected twice last week, and Felixstowe services were affected by freight congestion - the sooner that Derby Rd - Trimley section is dualled the better. The swing bridge at Oulton Broad has affected the East Suffolk Line on a number of occasions and the failure of a Class 47 caused the last Summer drags to Yarmouth to be knocked on the head. On the Mainline again not a bad week in comparison to others. A few short formations, signal faults and minor incidents but again nothing major causing lines to be blocked. I hope next weeks post is even shorter! And so another week has past, and with ShowBus being the new official end of Summer this is the penultimate Summer News Round Up of 2014 with only freezing cold bus stations, railway platforms, and black rear ends of buses due to salt on roads and bus washes failing to look forward to. Oh and maybe daft cartoon characters obscuring views from the top deck again. I'll be playing Scrooge again in Panto with my usual aplomb! Nothing to report from Ipswich this week. The remaining E200, 44516 was expected to return but didn't, and to my knowledge nothing else has gone up to Rotherham. So for the first time in this blog's memory pride of place goes to Norwich and the plans for their new livery, or should that be liveries. At this point it should be said that I have never been a fan of route branding. It started down in Kent (in my experience) in the mid 90's and I didn't like it then when a route branded bus was on a different route. 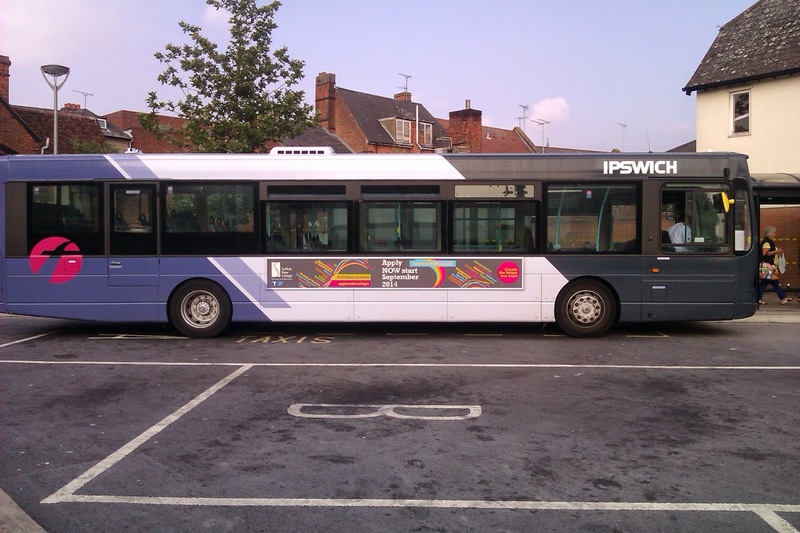 It just looks amateurish and confuses the passenger far more than a different livery (if a different livery is so confusing why do buses have all over ads these days - and there were 4 different liveried ALX400's on the 66 in Ipswich the other day). Anyway it seems the idea is to paint the Norwich buses in the same style as the Ipswich ones, except the front colour will be the colour of the route they are on, so red routes will have a red front, green routes green fronts etc. 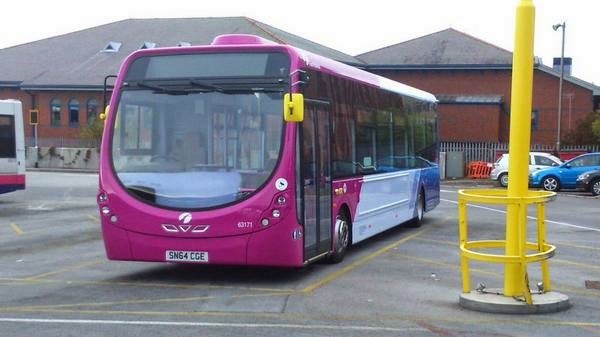 The first bus to be painted is Volvo B7 Plaxton President 33163 of the Purple Line which will have its front end painted purple. This tells me two things. 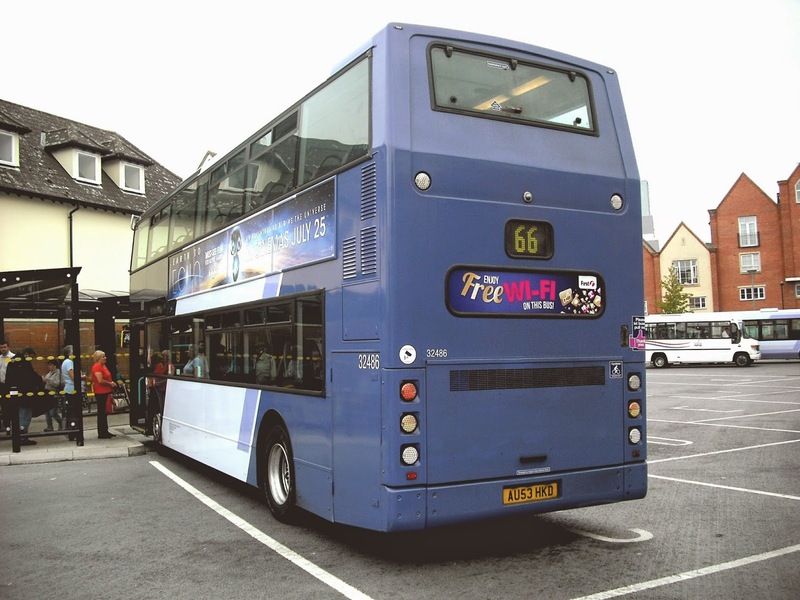 Firstly Norwich will look like a Dulux paint chart and secondly if the first bus to be painted is a President it tells you just how much updating the Norwich fleet is going to get. Probably blown the budget on paint! I have no idea why companies these days think passengers are so thick. How on earth do they manage in London where everything is red! Actually London is a great example because they DO manage, and extremely well. In the late 80's early 90's buses in London came in all shapes and colours. I myself drove blue and yellow buses in London. Oh yes and Ipswich green and cream ones, white ones, and when Kentish took us over yellow ones too - on the same route. Then there was Metrobus (a different blue and yellow), green ones from Transcity, yellow and red from Citibus plus the red traditional London ones. That was just in my area. Passengers, particularly tourists, didn't know if they were coming or going as they were all used to red ones. The red system was a simple system - a bus turned up and passengers looked at the destination screen and knew what route it was on and where it was going. Clever eh! Eventually Transport for London realised that actually it worked and from then on all buses on TfL work had to be 80% red again. Of course all over ads are allowed as the Borismasters are showing, but that doesn't matter as passengers are used to checking destination screens. No one misses an 11 if it isn't red because it still says 11 Liverpool St on it. What would cause confusion though is if all the Borismasters on the 11 had 11 painted all over them like a Banksy mural, then one of them turned up on the 38. (Yes I know different depot it's an example). This is inevitibly what is going to happen in Norwich. Get people used to colour coding and they stop checking destination screens. Then when a Yellow bus turns up on a Purple route they will let it go as not all of them will be monitoring the excellent Norwich Bus Updates on Twitter. It makes me laugh that one of the reasons 33423 is being repainted is because the poor darlings in Gorleston apparently can't tell between a 1 and an X1 and which is going to Norwich, Presumably they can tell between a 1 and an 8 and which one is going to Martham? Or a 2 and a 7? Did they let the Barbie liveried Gemini B7's go by when they were on the X1 because they weren't white like the Excels? No they didn't as they read the destination screens. Of course they are used to blue buses now and have got lazy. That is what happens. Of course it would help if the X1's actually said Norwich on their screens at Gorleston. Ok rant over. Just don't insult the intelligence of passengers when there is a perfectly good tried and trusted way of seeing where a bus is going. Painting by numbers is for kids, and I can just see tourists and foreign students getting hopelessly confused as to whch buses they can use their tickets on. Norwich, instead of getting its own identity will have to be renamed The Rainbow City. Unbelievably not reported elsewhere is the announcement on Thursday that the top man at Konect/Anglian, Julian Paterson, is to leave the company in Novemnber. A notice was put up at Konect's depot at Dereham and word spread very quickly. I hope to do a feature on Julian Paterson's career at Konect before he goes as he leaves quite a legacy. 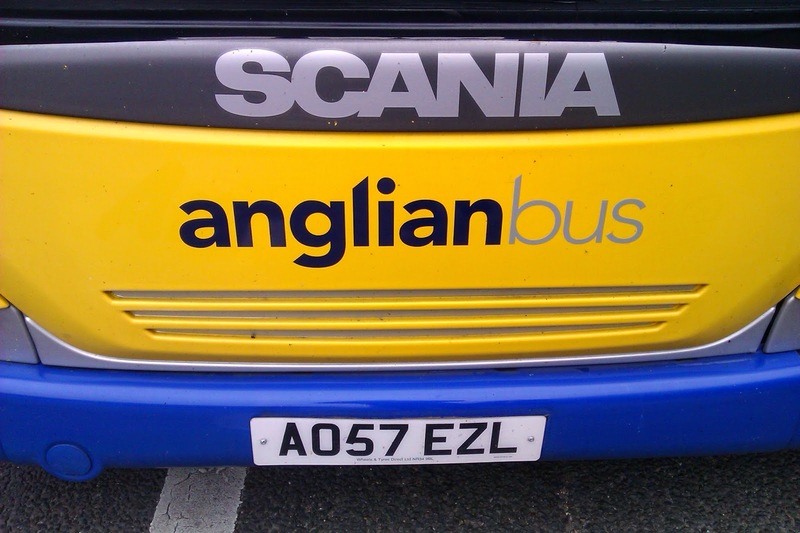 Anglian have reported on their website that the last of the Versas have transfered to Konect. Konect in turn have apologised to passengers on the 53 for buses still in Anglian colours on the route - passengers who are used to, erm, buses in Anglian colours on the route! 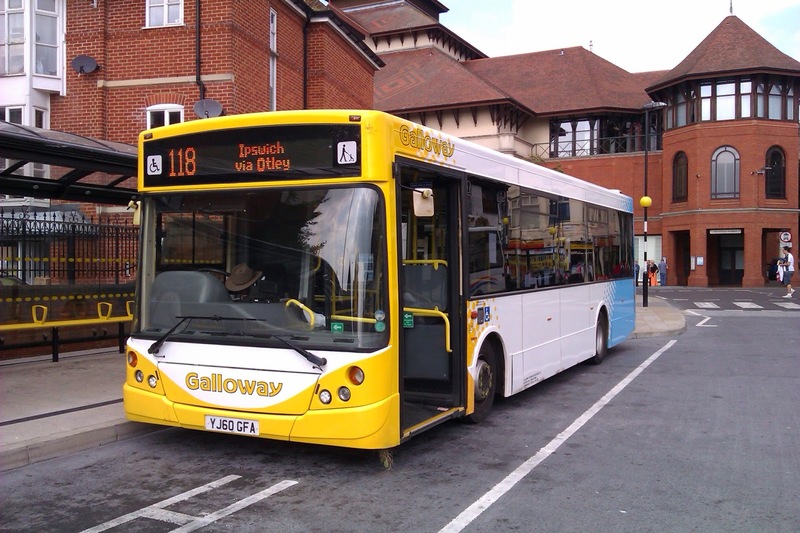 I was surprised while in Ipswich to see a Galloway MCV Evolution on the 118's, a route normally exclusively Solo operated with the occasional Beaver. Luckily for me the driver was a friendly chap and was happy to explain the situation. Quite simply passenger numbers have risen to such an extent a bigger vehicle is needed to cater for the students going to Otley College. 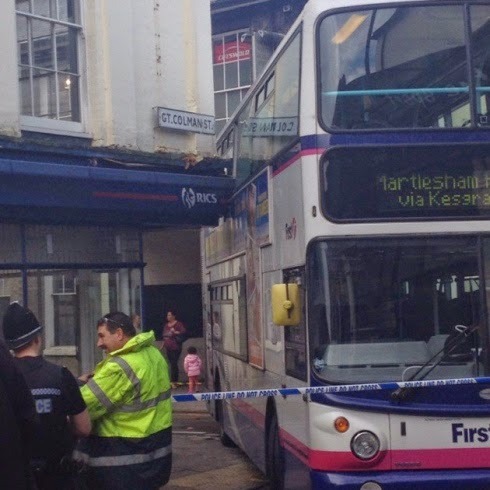 It apparently caught both the operator and Suffolk County Council by surprise. So if you fancy a ride on a Evolution head over to the 118 during school term and you'll get one. It's a bit big for the route and the driver was saying the extra size meant times were very tight but still good to see. 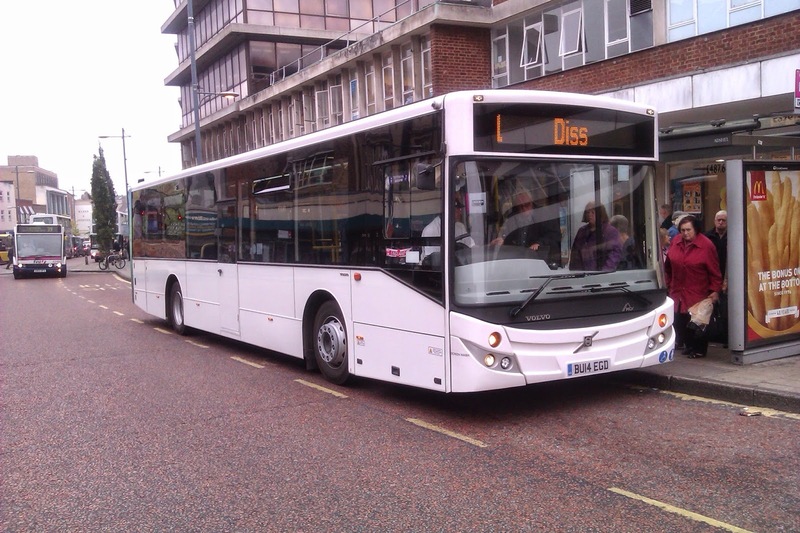 Norwichbuses blog have this morning reported that a new vehicle to Simmonds, E200 MX11 JYP was operating on the 113 between Ipswich - Diss yesterday. One can only hope it is the beginning of the end for those truly appalling Enterprise Plasmo Plaxton Primo's in which case I might at long last be able to explore that route as I refuse to voluntarily sit on a mobile rattly spin dryer for 90 mins! First Capital Connect are no more. They have ceased to be and joined the long list of ex rail franchise holders. As of today Go-Via trading as Thameslink and Great Northern take over with what be UK's biggest rail franchise when the Southern network joins it in July next year, although Southern will retain its own branding as Go-Via have been operating that franchise for many years now. Many improvements have been promised. We shall see. Yesterday saw the last Yarmouth drags of the Summer. Well should have done but 47813 threw a hissy fit so the last two didn't run. I love the 47's, but they are so unreliable now maybe the time has come to retire them gracefully to heritage railways and let the 68's take over. Anyway it does give me the opportunity to post once more one of my fav pics of the Summer. Sorry this week has been such a rant and keep checking in over the coming days. A few months ago I expressed surprise that I had travelled on a Solar bodied Scania with comfortable seats, in fact I think I described it as my nicest single deck Scania journey ever. The vehicle in question was 65692 YS03 ZKM. Sadly in a matter of weeks she had gone, with her two sisters 65690/1 to Clacton, to be replaced by E200's I ask you, and the only comfortable Scanias to be found on FEC had vanished. Tonight I was delighted to receive an email from legendary contributor Robert Appleton, who sent me a huge number of Olympian pics when it was thought the Yarmouth Olympians were reaching the end of their lives. Thankfully that proved extremely premature so his pics remain on file, but tonight Robert has sent me pics of those three Scanias at their new home in Clacton, together with recently transferred from Lowestoft SLF Dart 43489. The Scanias have been repainted and look pretty good it must be said. And finally here is 43489, which I confidently predicted was on its way to Braintree. Not to be just yet but bet my life she ends her days there! Many thanks again to Robert for sending me the pics - it's always good to see transfers in their new home. Greater Anglia Announce Mk III Stock Overhaul. 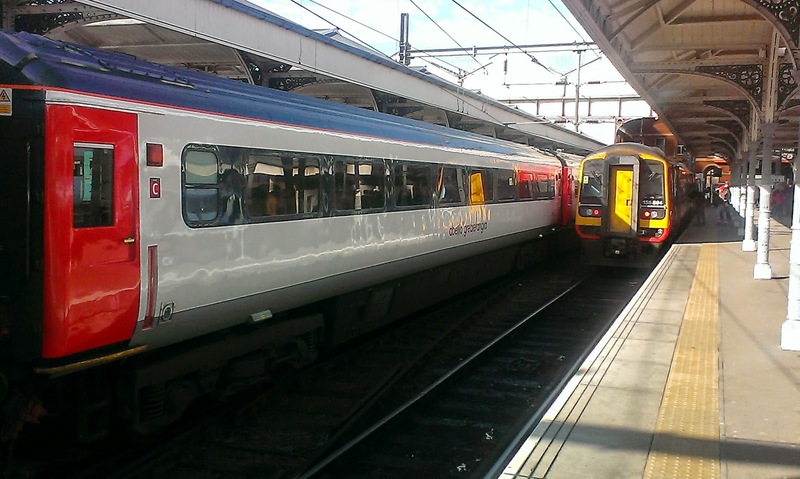 Not my most witty headline I admit, but Greater Anglia have today put to rest some speculation and rumours over the future of the Great Eastern Mainline by announcing the overhaul and refurbishment of the Mark III Intercity coaches on the Norwich to London route. There had been speculation that the route would be downgraded from Intercity status which would have meant EMU's replacing the Intercity stock. However, Greater Anglia have announced that the contract to carry out the refurbishment work has been awarded to Vossloh Kiepe UK. The following is taken from the GA website. You can read the full report by clicking here. Exterior painting of all carriages is also currently taking place as part of a separate programme already underway. The work will be undertaken at a specially prepared facility at Abellio Greater Anglia's Crown Point Depot in Norwich and the first refurbished carriages are due to enter service in the first quarter of next year, with the full programme completed by the end of the train operator's current short franchise in October 2016. I have mixed feelings about this. GA do not say if newer locomotives will be brought in to replace the increasingly unreliable Class 90's which seem to be failing on a wholly unacceptable basis. Passengers don't just want comfort they want reliability before comfort, and a fleet of new class 379's that are proving to be most reliable might well have been the better option. Only First Class passengers were worried about losing Intercity status, as it would have meant a downgrading of 1st Class facilities. But the main downside of retaining Intercity status on the shortest Intercity route there is is this. Had the route lost its Intercity status the Network South East area would have been extended, certainly to Ipswich, maybe further north. That would have been of great benefit to passengers regarding fares, and the availability of tickets such as the Network Card being able to be used north of Manningtree. However these coaches are long overdue a refit. It is good to see power sockets will be fitted, new loos, lighting, flooring and seat covers. Just a shame that the exterior doors will remain the big, cumbersome manual things they currently are, making disabled access difficult. New electric doors and redesigned vestibules would have helped boarding and alighting, and reduced the amount of time the train needs at stations, thus improving punctuality and journey times. But it is good to see the work is being done at Norwich, which should create a few jobs in the region, although those enthusiasts cureently enjoying the regular empty stock moves to Wolverton for repainting will be disappointed that these will cease! It is also positive that despite having a short franchise GA are taking this step to improve the Mk III coaches and I look forward to sampling the newly refurbished coaches when they start rolling out next year. 25 years ago I was driving for Boro'line - formally Maidston Corporation - out of their Crayford depot operating services in South East London - Bexleyheath/Woolwich/Eltham areas. 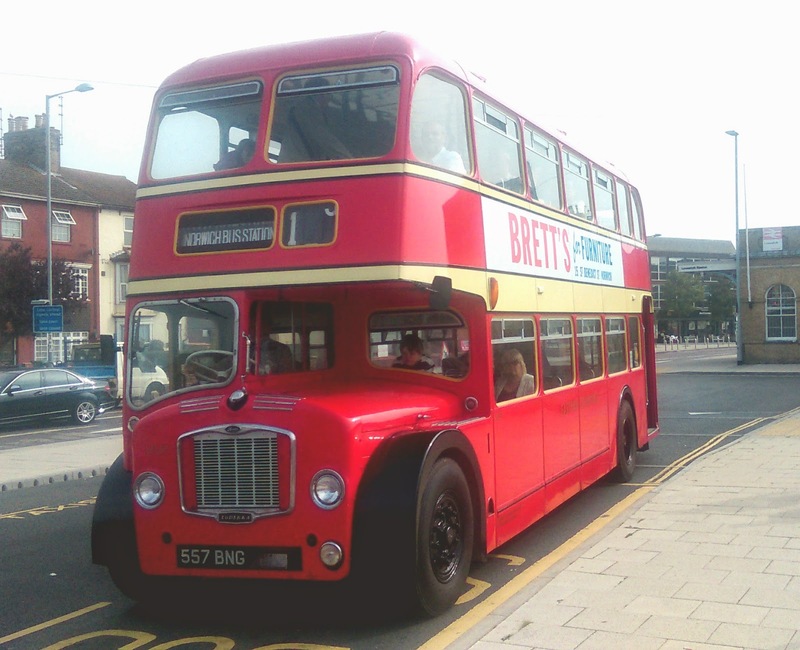 When I started we had, in true Maidstone Corporation style, a truly eclectic mix of vehicles - Leyland Olympians, Nationals, Volvo Ailsas, Scania 113 deckers, and a fleet of Leyland Atlanteans on loan from Ipswich Buses. I loved them, the bucket style drivers seats could have been moulded on my portly shape, and it was real driving. The best day;s overtime you could get would be to take one up to Ipswich to be swapped over as Ipswich still maintained all of them. Happy days, and it was the memories of that which inspired me to move up to Ipswich when I was lookng to relocate some 8 years ago now. And so I thought it was about time I went back to Constantine Rd to see if it jogged any memories. I wrote to Malcom Robson, Managing Director of Ipswich buses and asked if he could spare time for an interview and look round the depot. The response couldn't have been more enthusiastic and positive, and so today I arrived pretty excited. It turns out that Malcolm Robson joined Ipswich Buses around the same time I was driving them in London so he is approaching 25 years in the job now. Malcom is a Yorkshireman, who cut his bus teeth in Hull, and as I like the dry Yorkshire sense of humour I recognised an almost mischievous twinkle in his eye when he was talking about certain things. I felt at ease immediately. Now the bad news. If you are waiting for me to start shouting things like "exclusive" and "big news" then you are going to be disappointed. 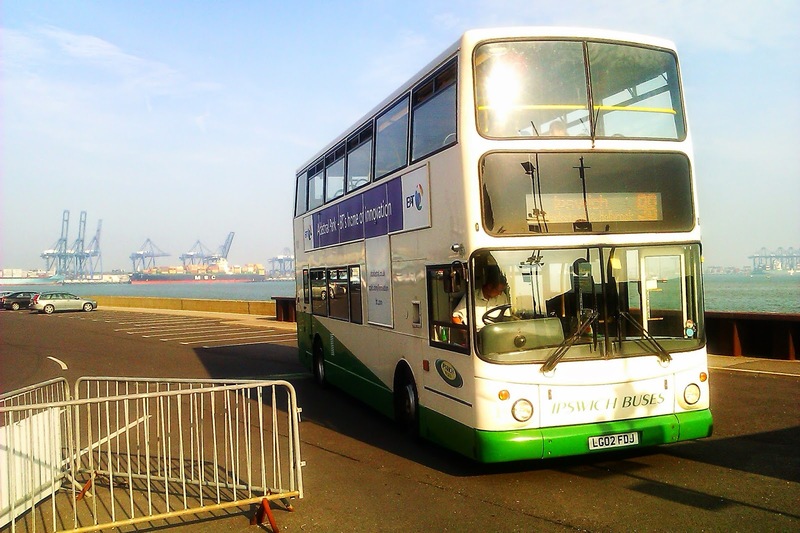 There are no plans for any new vehicles in the foreseeable future, no new routes, although the Felixstowe Sunday trips will return next year, and everything is ticking over very nicely thanks. The E200's were offered at such a decent price he could hardly say no, which was history repeating itself as the East Lancs Darts were bought at a bargain price too, the only reason they are there. So what did we talk about if there are no new routes or vehicles coming? Well I like my facts and figures, and I'm happy to say I came away with plenty of them. As a Concessionary Pass holder myself I have long said I would be happy to pay say £25 a year for mine as long as the money was ringfenced to provide more buses during evenings and on Sundays. That would create jobs and get people going out spending money in the general economy, something that was pointed out only today by greenerjourneys.com - that for every one pound spent on funding bus passes it creates £2.87 spent in the general economy. However it's not that simple. Malcolm told me that in 2008 IB received £1.20 for every Concessionary journey taken. 6 years later that has fallen to 93p. 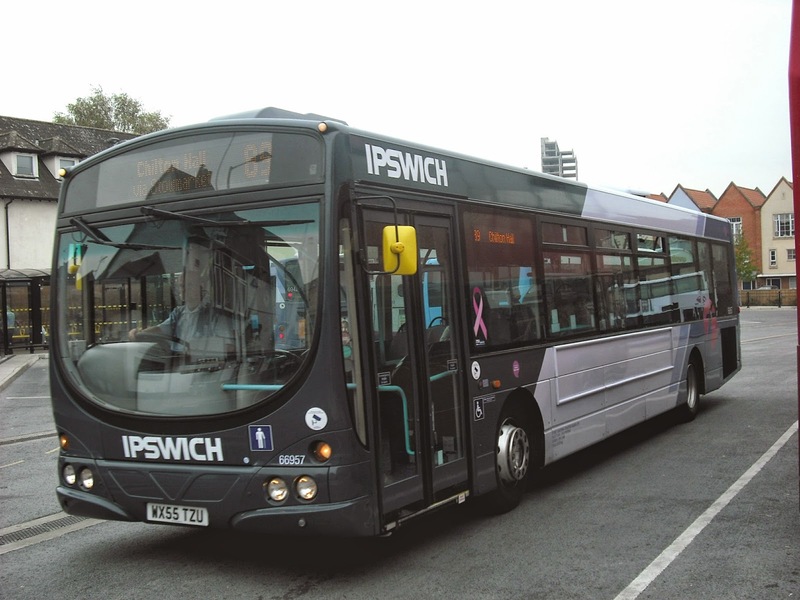 It has been calculated that to get back to the 2008 level the 19,000 pass holders in Ipswich would have to pay £50 a year, and that's before extra money is generated for new services, which obviously those paying would want to see. Now for some more stats. 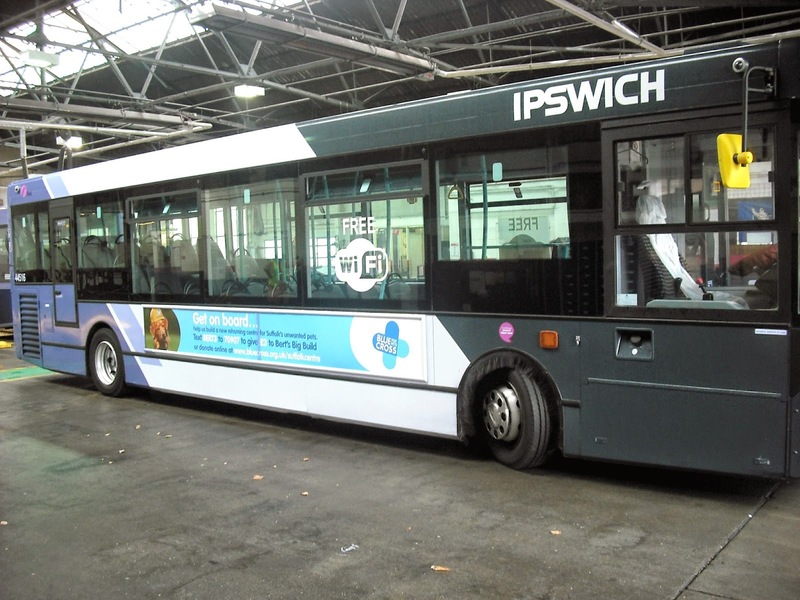 Only 22% of journeys in Ipswich are made by fare paying passengers, which seems a little unfair as they bear the brunt of any rises, and can't vault from bus to bus like Concessionary pass holders. I repeat my appeal to Suffolk County Council to get everyone round the table and launch an integrated ticket - which Malcolm told me is number two on the list of wishes of passengers behind punctuality. 40% of journeys are made by children/students and 38% are passes. Quite interesting but surely the target must to be to get that 22% higher. Over to the strategists for that one but if you don't speculate you don't stand a chance of accumilating, so trial and error on new routes must be considered to take the bus network not just back to past areas but new ones too. Ipswich buses did just that when they launched the X3 to John Lewis in Ravenswood, an area that is still being developed. 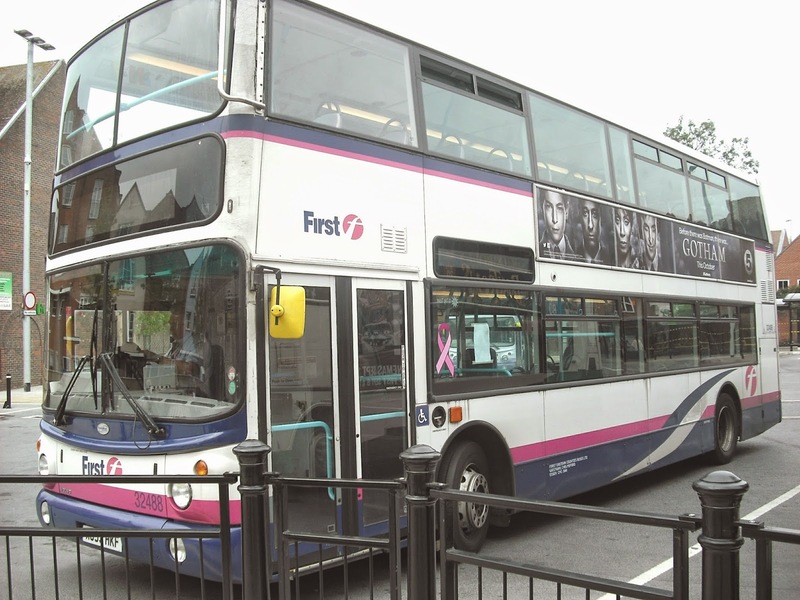 After an initial rise in passenger numbers of around 74% in the first few months after the route was launched it is still rising at a rate of 17%. That is qute an achievement, and backs up what this blog has said since its conception, that new routes are preferable to passenger poaching off existing routes. The passengers are out there, it just needs the right services going to the right places at the right times and the right prices. Not an easy nut to crack all the time but it seems IB have done it with the X3. 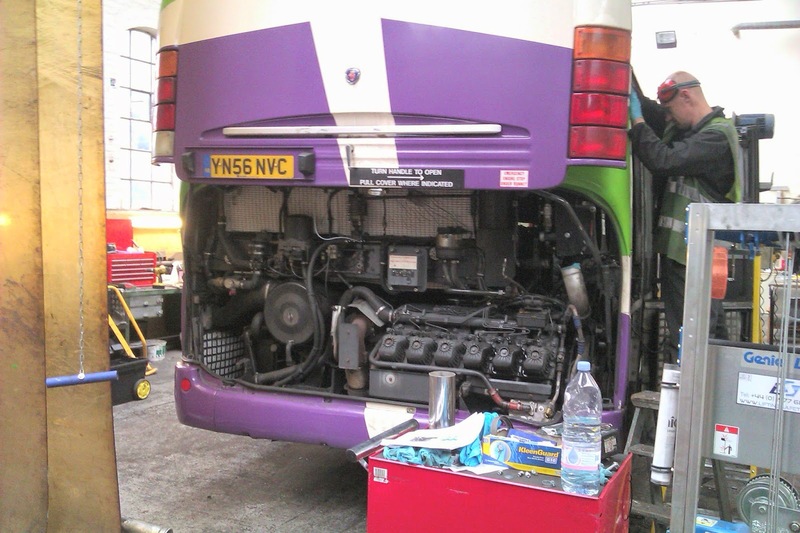 To mechanical stuff now, and I was told that the P&R Optare Versas have been fitted with a cooling system that claimed to have a dramatic saving on fuel consumption. I got the impression that claim was met with a little distrust, but it has proved to be successful. A fuel efficiency saving of 10.3% successful to be precise. 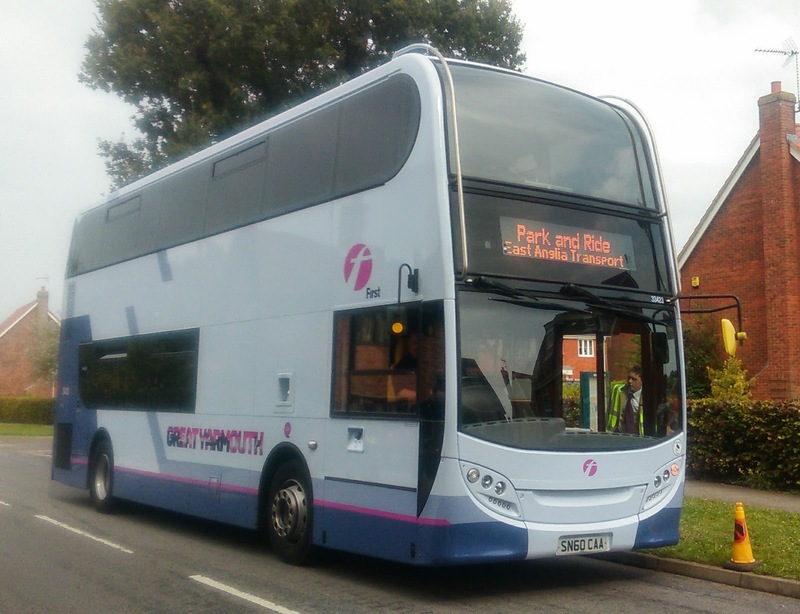 Apparently the same systen can be fitted to Scania Omnicity's, which are notoriously thirsty, so three of them at Ipswich are being done. 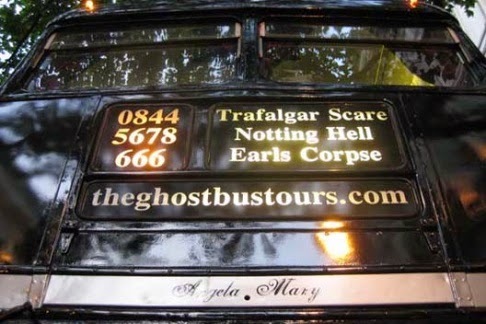 The good thing about guided tours is that you find out things that no one ever has mentioned before. This is my favourite fact of the day. 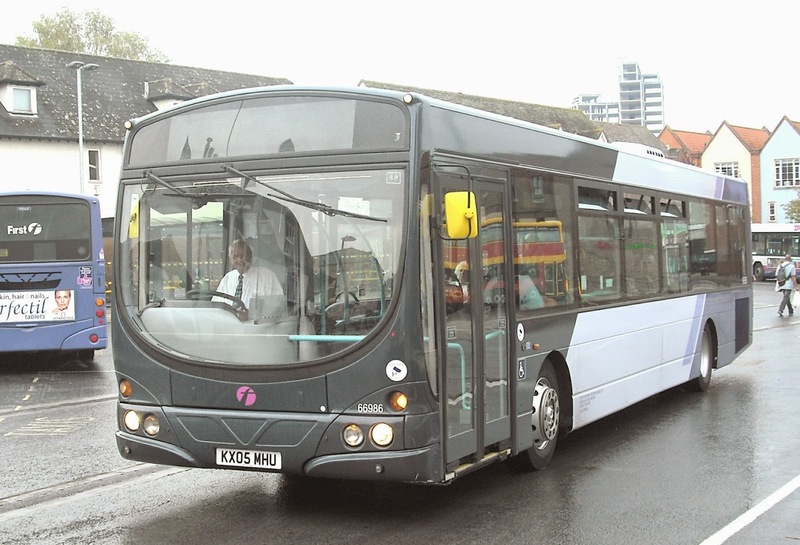 Optare Spectra 60 P442 SWX is named "Delight". It's not unusual for an IB bus to be named, but the reason behind this name is really sweet (pun intended). This Optare started life in Turkey as a Left Hand Drive vehicle, and was converted back to RHD when brought back to these shores. So IB decided to name her "Delight" to reflect her Turkish past. Told you it was sweet and they have a dry wit in Yorkshire. And that's really about it. Ipswich Buses is a company that is happy with its lot at the moment. They aren't under pressure to poach passengers, or start loads of new routes, or find new ways of increasing revenue. They are under the control of a knowledgeable, shrewd and welcoming man who knows how to look after his brass but isn't afriad to try new things - the use of the open topper in normal service earlier in the Summer was a masterstroke in my book, and was the sort of spontaneity that is truly lacking elsewhere. I felt extremely welcome at Constantine Rd this afternoon, and have been invited to contact them at anytime. not that I'll need to as things are on a very even keel there. My thanks to Malcolm Robson and his staff for such an enjoyable chat and tour, and look forward to more chats in the future. I liked Ipswich Buses 25 years ago and absolutely nothing has done anything to change my mind now. For the first time this year I was able to get out of my village on a Sunday and so off to Lowestoft for the annual End Of Season Gala at the East Anglia Transport Museum. That's the good news. The bad news is the camera on my new phone decided to pick this day to lose all itrs sharpness so my apologies for the poor quality pictures - I am currently having a monumental struggle with EE to get something sorted. So after parking up at Lowestoft Station I waited to see what would come round the corner to take me to the museum. I wasn't disappointed when EATM's own Bristol Lodekka FL6G (formerly B) 557 BNG pulled into the station. I couldn't help thinking as we made our way to the museum that this 52 year old vehicle gave a decidedly better ride quality than most new deckers do. 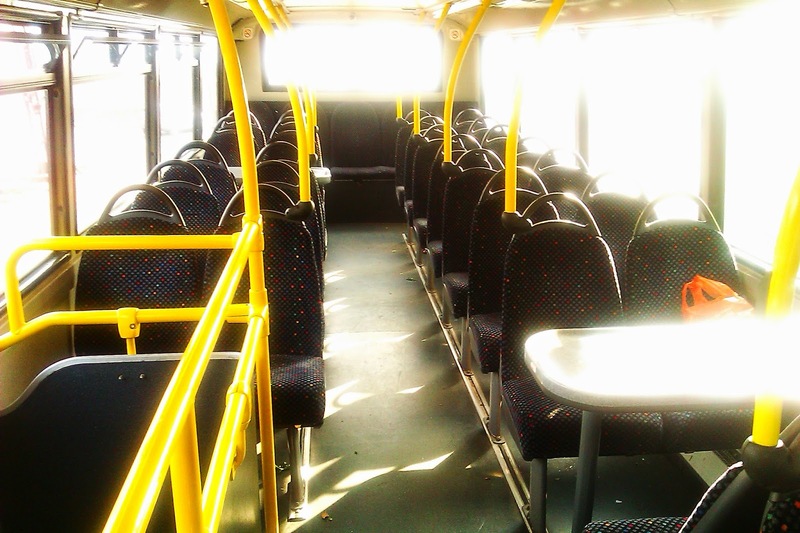 The seats were more comfortable, not a rattle to be heard and it was quieter all round. So we got to the museum and I was immediately greeted by Sam and Kieran from Norwich Buses. Nice to meet you at long last, Kieran and I look forward to many chats in the future. I also spied Des Speed on traffic duty and went up to have a word with him, while noting E400 33423 had pulled up operating the Park and Ride service. Never one to miss an opportunity to take a pic of this magnificent vehicle I did so, then finally, after ten and a half months of blogging, got my first chat with Chris Speed, Business Manager of First Eastern Counties, who was driving the aforementioned mobile work of art! This was good news. Chris now knows I don't come equipped with horns and pointed ears, and I now know Chris is a really likeable, friendly guy who I look forward immensely to getting to know better even if his art appreciation is a little lacking! I spent a really productive and pleasant hour chatting to Chris while doing a couple of circuits on the P&R, discovered some revelations about his opinions on certain things which I'm not going to reproduce here, and no matter what happened for the rest of the day knew that my journey had been worth it. Good to meet you at long last, Chris. I know, I know, but she just won't look the same in X1 colours. Note the destination screen which did scroll to say "museum" too! I then met a gentleman who quite simply is a God in the bus world. Syd Eade has encouraged me from the word go with this blog, and is always prepared to supply pics and words of support when asked and finally we got to meet. He was with his simply amazing Leyland PD2, co-owned by Daniel Peart and Richard Alger, and my only regret of the day is that I didn't get to ride on it as other things took up my time. Syd, we are planning a drink at some point in the near future and I can't wait. Darn it that bus looks good inside and out! Syd kindly sent me a pic of their baby operating a dusk journey which looks better than anything I took on the day so it gives me pleasure to publish it here. Those were the days, Syd! 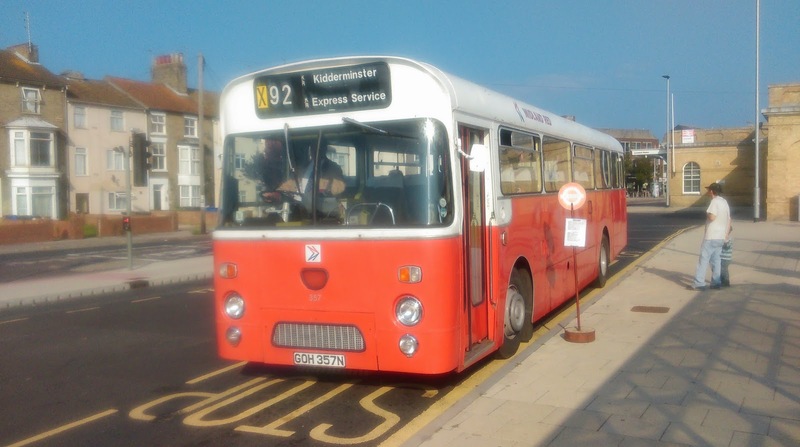 Another trip round Lowestoft was called for, this time on London Country RT3125. Beautifully restored I would happily ride on these any day, and judging by the looks we got from those who saw us pass by I'm not the only one. Funniest moment of the day was when two ladies made a dash for a bus stop thinking we were in service - shows not all passengers take notice of what colour the bus is! RT3125 KXW 234 about to load up. Just wow! I then spent the afternoon in the company of Roy from East Norfolk Bus Blog, who took delight in revealing the recent page views for bhis blog. Roy, I'm not jealous in the slightest, but it is a goal to aspire to! Also with us for a spot of lunch was Colin White, joint editor of Eastern Transport Collection Society. A pleasure to meet you, Colin. You can learn so much from people like Colin, who have dedicated their lives to public transport, and the younger enthusiasts would do well to get to know the likes of Colin, who can impart much knowledge, tips and wisdom. After looking round the museum with Roy, including a long chat with the owner of the newly painted Eastern Counties Leyland National featured in Sunday's News Round Up, where we were joined by Chris Speed which sparked a discussion on how all 4 Eastern Counties liveried buses (the National, Greenway, Bristol and VA479) could meet up for a one off photoshoot, it was time to end what had been a very worthwhile and productive day. I was hoping to go back to Lowestoft on Syd's PD2, but that was swapped for a Midland Red dual purpose Leyland Leopard,which brough back more memories than you can shake a stick at. I used to travel on these machines regularly as a boy going home from school courtesy of Maidstone & District, and very nearly bought one myself 20 odd years ago. That fell through but the ride on this old girl was just brilliant. Unfortunanetly my camera had just about given up the ghost when I took the pic, which is so annoying. My thanks to EATM for putting on such a great event, and to everyone I met during the day, those I already knew and the people I met for a first time it was a pleasure to see you all, and here's to ShowBus in a couple of weeks.